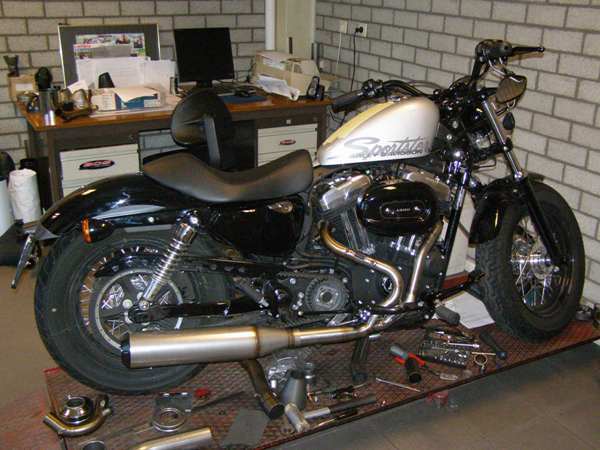 2-2-2012 - In this article we describe the development of our Torque Hammer full exhaust system for the HD Sportster 48. 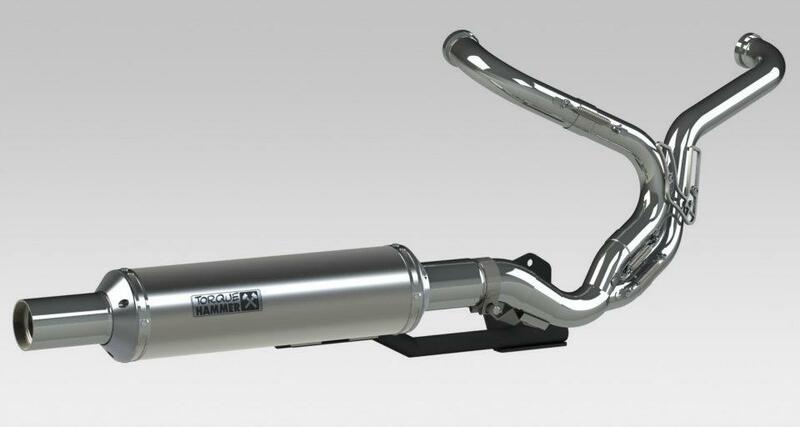 This system will fit all 2004-2011 Sportsters. 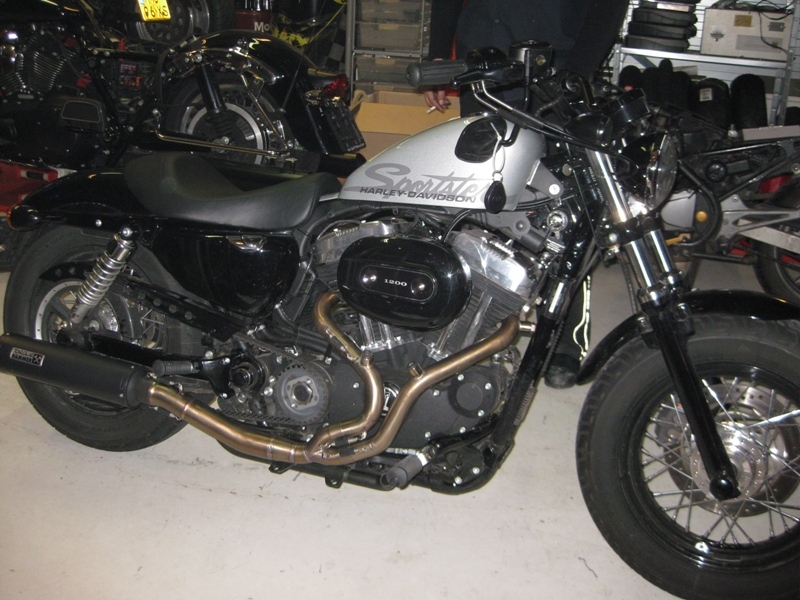 This exhaust is developed on a Harley Davidson Sportster 48 with a 1200cc stock engine and will fit all 2004-2011 Sportster models with mid or forward controls. even saddle bags can be fitted and duo passenger can come along. Because we develop performance products that can win prices and sprints we first find the performance and then do the styling. Keep that in mind when you read this article. In the picture above the lines of the headers will follow the frame better. The angle where the 2 headers come together will have a better flow to the bigger peace and that will be one straight line. This is only our TEST example. 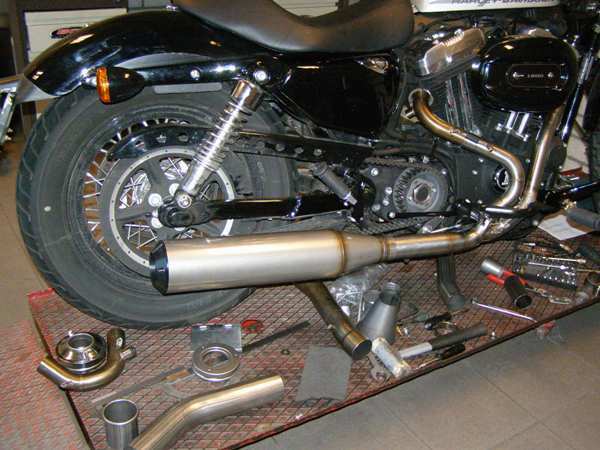 After developing a lot of exhaust systems for the Buell XB9 and Buell XB12, and the Buell 1125, and other (the complete story of the Development of the XR1200 Torque Hammer full exhaust system can be found here) we started with the Sportster market. 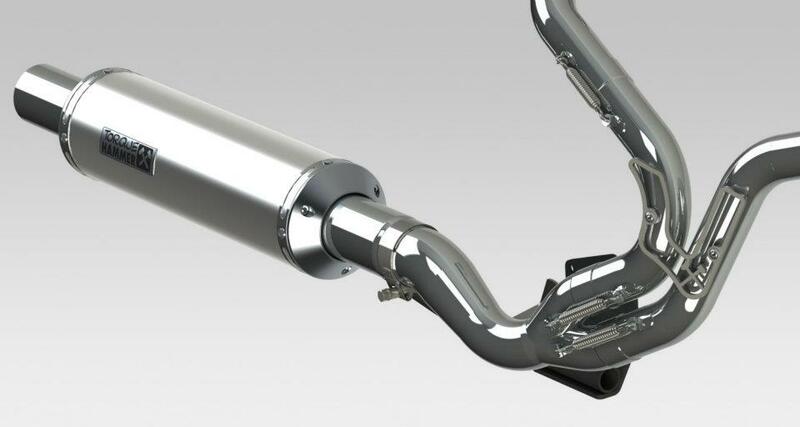 Our goal is to develop a complete solution, Full exhaust system with 200% perfect running tune. It should be a out of the box solution that you can install at home. 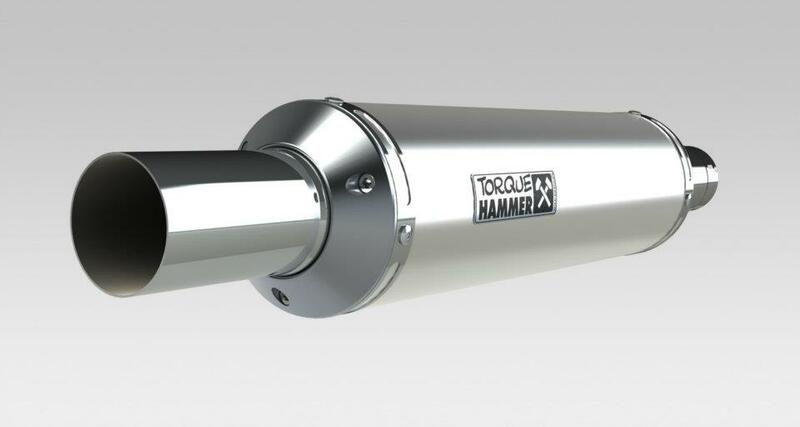 This is the beginning of the testing of our Torque Hammer full exhaust system for the Harley Davidson Sportster 48. We us the Mastertune software that is a part of the complete kit. Below you can find the movies we made today. 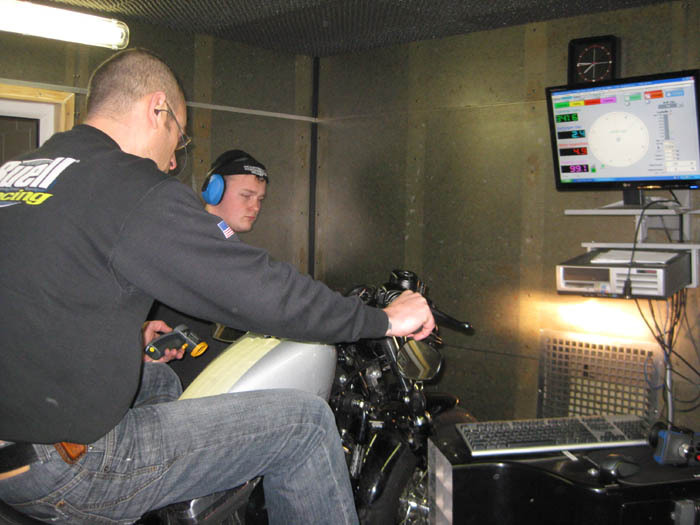 Tomorrow I start testing and there will be more Dyno info available. Then I will lock myself up for a day or 3 and make the final fuelmap for this setup. First movie, no db-killer we are no actors so forgive our quality and text. Here is the complete movie, no finger on the Microphone. 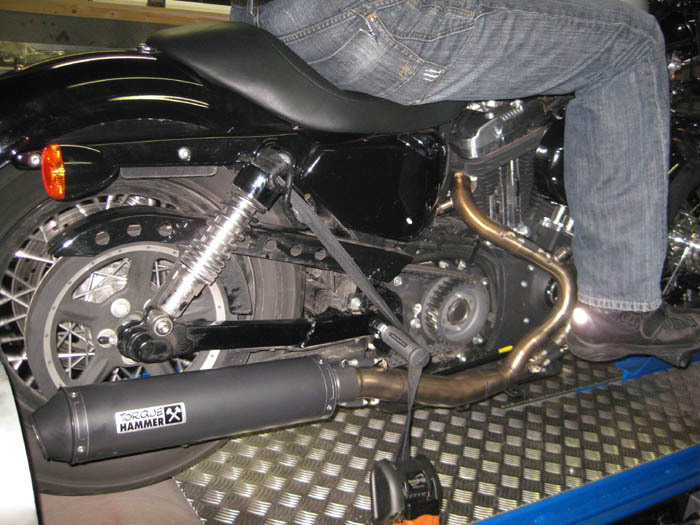 The story of developing the best performing exhaust for the Harley Davidson Sportster 48 continues. We received the bike from the owner with the following information. It was tuned with another dynoshop. They made a bone stock run with the bike and they produced 57,4 HP and 92 NM of torque. I have no idea how that was measured and if it was SAE corrected yes or no. After that run the dynoshop tuned the bike. For doing that the shop used Techno research software, (i don't use that). They changed the exhaust to a 2 single pipe system, it was a lot of chrome i remember and heavy, and a big sucker air filter. From that point i have the data of the bike. 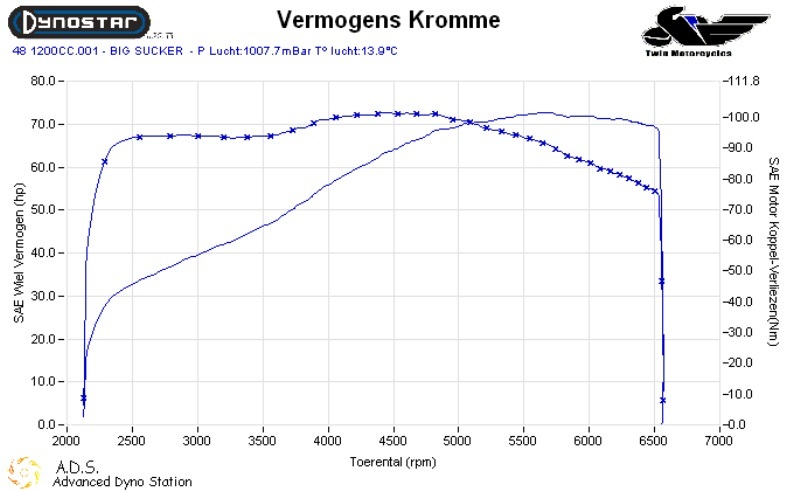 Below here is my stock run with the bike as it was completely tuned 72.8 HP and 102 NM of Torque. It is not looking bad, only the Torque should be concentrated around 3000-3500RPM, in that area you will ride this baby the most. 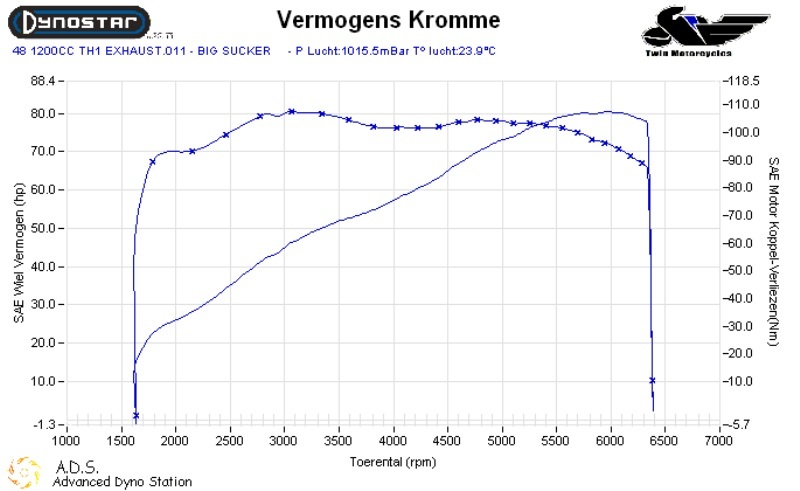 Oke sit back and relax here is my result after using different pipes diameter bla bla bla, I know what i do 80,4 HP and 108 NM of Torque, yyeeaaahhh baby. Don't forget my daily work is developing performance products only. I almost sleep in the dyno room. I take my time to do my stuff and do this some years now for air cooled engines. I also took a dyno sheet from a stock XR1200X 2009 model completely stock with the tuned Harley Davidson Sportster 48 with our Torque Hammer full exhaust system and big sucker air filter. 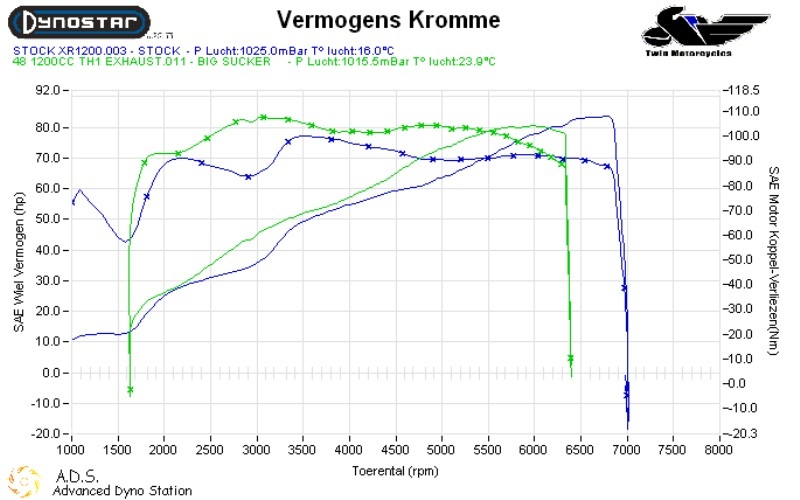 That's what I mean, the green lines is the tuned HD Sportster 48 compared with a bone stock XR1200 X. I would love to see these 2 bikes on the road at a stoplight racing each other. Oke, I called the dynoshop who dynoed this bike and asked them if i could stop by and let them make a dyno run with the bike and my full exhaust with tune. 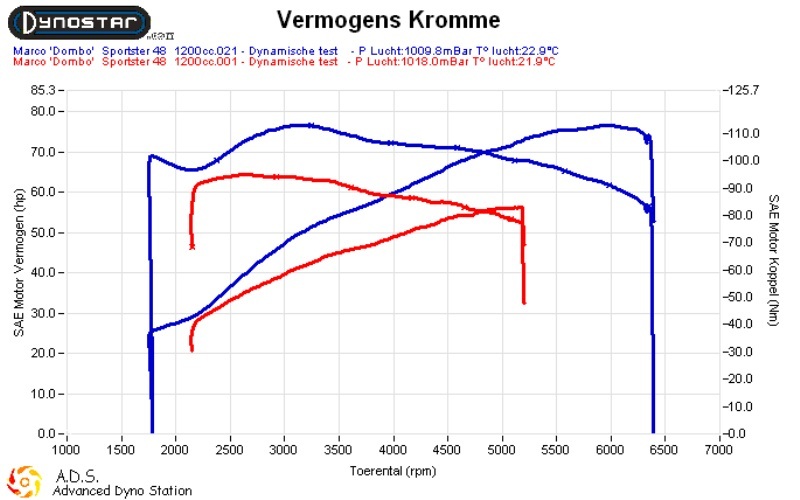 The difference compared to stock situation on there dyno is 23 HP and 16 NM of Torque. The only way to compare this, is to let them make the run with the bike on there dyno and then lay the 2 dynosheets against each other. I will do that tomorrow. This Morning I picked up the owner of the Bike, and we drove to http://www.viadaytona.com/ The owner is Eric, he tuned the bike for this customer and did the first dynorun with the bike on his dyno. To get a good compare, i called him yesterday and asked him if it would be oke to test the bike on his dyno and compare the bone stock run. Thanks for the pictures dombo. 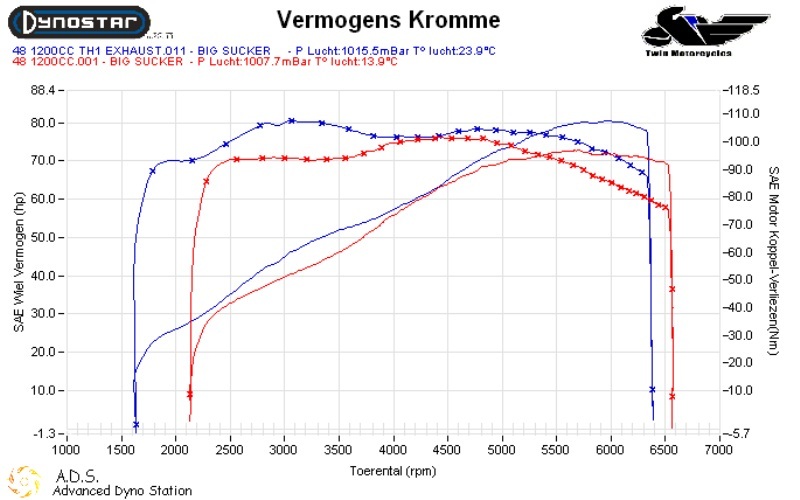 The bike made yesterday on my dyno with the db-killer 80,4 HP and 108 NM of torque SAE corrected. Today we tested the bike at via Daytona now at another shop without db-killer and it made 77 HP and 113 NM of Torque. 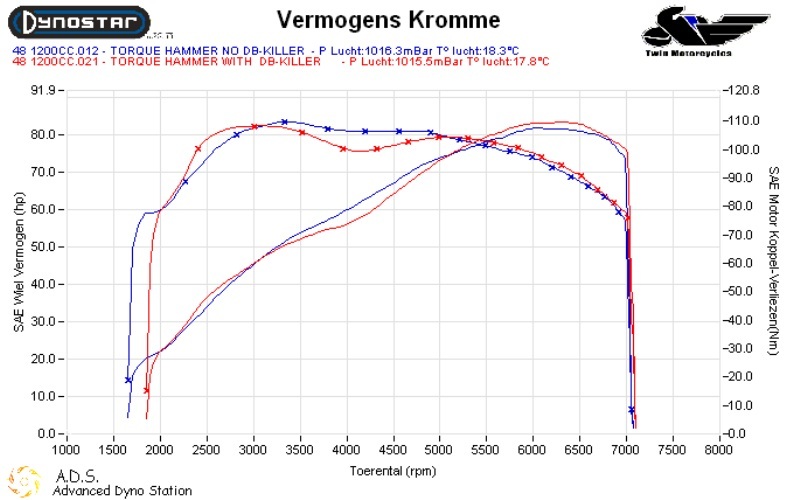 The difference in HP and Torque is made by the db-killer. The midrange without the db-killer is stronger but will drop 3 HP. With db-killer we gain 3 HP and loose 5 NM of Torque. 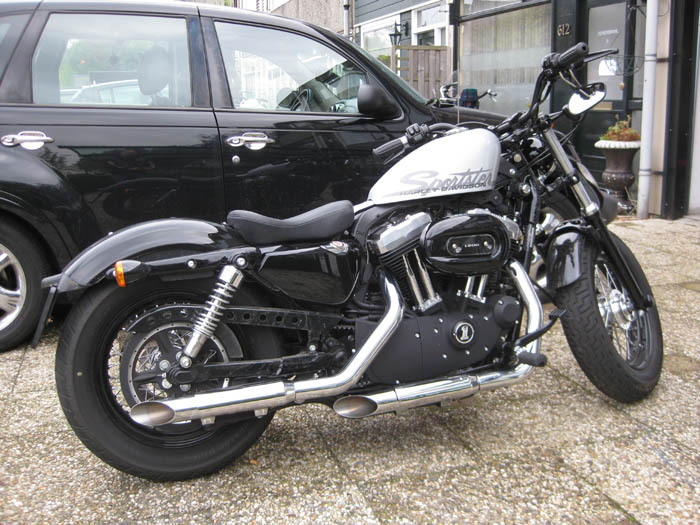 We gained with our stage 1 kit for the Sportster 48 depending if you use a db-killer between 20 and 23 HP and between 16 an d 21 NM of Torque compared to a stock bike. 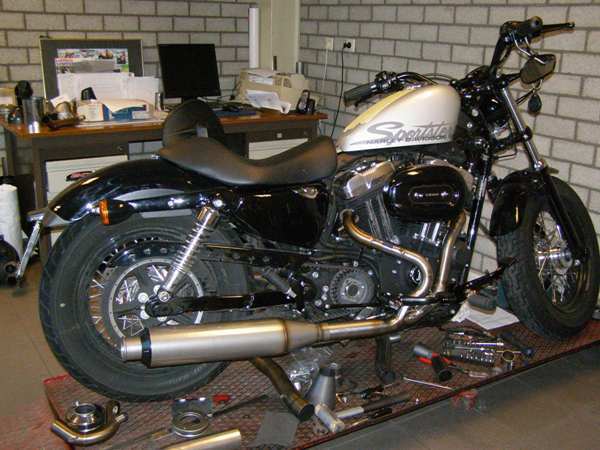 We will sell this setup soon as a stage 1 Sportster 48 kit with all parts together. We will change the headers and work on heat shields to make this system fit all Sportster models. I still need to make the fuel maps that about 5 days of work (0: And I need to find a 883 Sportster to see what we can achieve here. We will try to make it look like a real retro system classic and not too sporty. SOON FOTO'S OF THE FINAL VERSION. Some people may think what the bungs are under the air filter. I first make my fuel map by tuning my timing map for this exhaust, then i make my Air Fuel target map and then my VE tables all that I do with the 02 sensors not connected. after that i connect the stock 02 sensors and my own wide band O2 sensors, and tune for the lack of problems the bike have and correct the ECM and the software with what i really measure with my wide band 02 sensors, It's a lot of work like this but it makes the bike ride really smooth in all RPM, pull like a train and give 200% reliability for all situations. 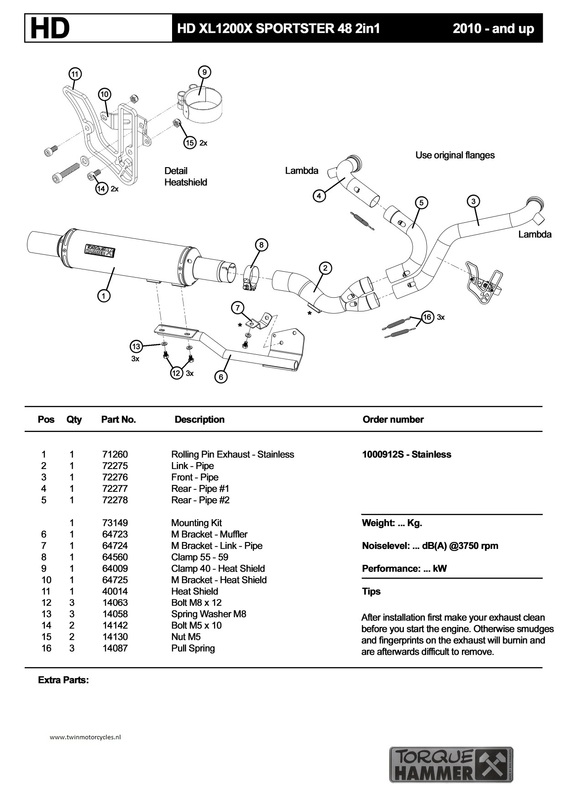 That's why we don't have complains with our ECM mappings made for our exhaust for the Sportster. We have customers in almost every country in the world, Hot weather, cold weather, altitudes difference for the same reason we only use Mastertune software and nothing else. Below is a picture of the prototype of the headers. We need to make a complete solution to fit on all 2004-2011 and future Sportster models in the carburator and fuel injection models. We also need to calculate that there will be a duo passenger with the footrest on the original place and we have forward controls and mid controls to take care off. In the picture you can see we have mounted them all and we have the first prototype of the bending of the headers. We need to give it a more classic look and make heat shield with little holes like the rear belt guard for those who like to have them. And we need to work on a more classic rear slip-on model. Oke here are some more ideas about the styling we are working on. Oke today I tested the final production version. This means that we don't change anything anymore on the sizes of the inner tubes, length and bends. Stock bike made 57,4 HP and 92 NM of Torque. In the graph above, you can see very good what happens with removing the db-killer. The Midrange is getting very strong and you loose some top end HP. With the db-killer installed you gain some top end power and loose some midrange. I don't change this because it is not so easy to make a good db-killer without loosing a lot off power. In the picture below you see I use 4 pieces of 02 sensors, 2 in the bike stock place and 2 to control the ECM with incorrect way of working. The Harley Davidson FI system is not working always as it should be, that is why i correct the ECM with my own measurement with the 2 wide band sensors. It is a lot of work like this but once it is running it runs beautiful. Oke, The bike go's back now to the Manufacturer to make heat shields and stuff to complete the system. 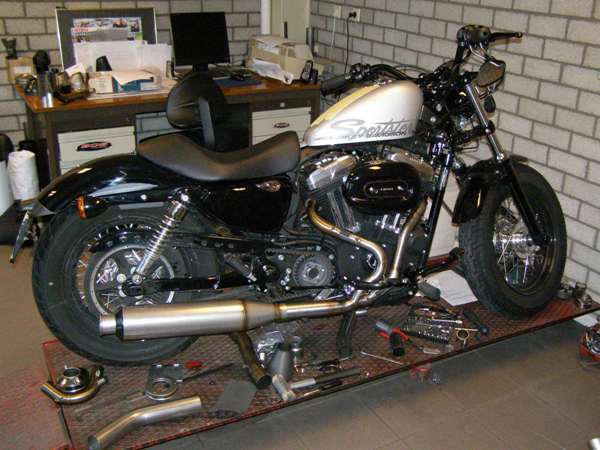 The exhaust manufacturer is busy with making the full exhaust system for the Sportster. He i snow busy with the bending and the first production. We also developed a heat shield.